In the past we have written about managing your child’s allergies at daycare. However, aside from allergies, all kids at daycare can be susceptible to food-borne illness, if precautions are not taken. The government of B.C. requires licensed daycares to practice food safety guidelines, which they publish here. As childcare facilities, we can do our part to prevent food contamination with our young pupils. But it’s also important we are teaching daycare kids about food safety. That way – we hope – there can be even fewer chances of unsafe foods making their way into kids mouths. And, we know how much little kids like putting things in their mouths, which makes this topic all the more applicable to the age group! Plus, food-borne illness is a real danger – 1 in 8 Canadians get sick from bad food each year. The World Health Organization also publishes that humans, including infants, can die of food toxins. So, the earlier you can instil these lessons, the better! Below are some guidelines for teaching food safety in early childhood! In the early years, most kids won’t be able to grasp the complexities of biology when teaching topics like harmful bacteria or botulism. However, just like when teaching all sciences to preschoolers, these topics can be explained in simpler terms, and in ways they can relate. For example, they may not understand the wording of microorganisms, but they can understand ‘little tiny bugs you can’t see.’ So it goes without saying that your teaching material will need to be simplified, based on the comprehension levels of the age group, and their prerequisite knowledge. Probably the best visual to explain food poisoning is to have a little mould experiment! Of course, do this safely with your kids. Try leaving a piece of soft cheese, fruit, or bread out of refrigeration, perhaps on a window sill and within a moisture-rich environment (like wrapped loosely in plastic). Leave another of the same food in the fridge. Let the kids see for themselves how quickly the fuzzy, yucky mould grows on one food group over another. And, while surely the refrigerated food will last longer, still keep it long enough to mould. Then show your kids that all foods eventually do expire. At this point, you’ll also want to teach kids at daycare what mouldy foods can do to hurt us. For example, stomach aches, diarrhea and vomiting. And in some cases, worse. This resource provides a chart of the symptoms that come with different types of food poisoning. You’ll also want to explain that it takes a while for the mould to appear, but it’s not always visible at the start. So we shouldn’t take chances when eating expired foods. In this section, it’s important to interject that not all food-borne illnesses are a result of mould. Sometimes, toxins from bacteria, or even chemicals can get into our foods that make us sick. Moisture elimination (e.g. show dry fruit, cereal or crackers). Acidity or PH levels (e.g. show lemon juice and olive oil, or the process of fermentation). Oxygen elimination (e.g. show ready-to-eat, shrink-wrapped rice, canned and jarred foods. Here you can also bring up the avoidance of botulism from dented cans). Temperature (e.g. show cooked meat to kill bacteria and frozen fruit to stop bacteria growth, or explain pasteurization. Make note that heat is not the solution to all food safety hazards). Contamination and infestation prevention (e.g. demonstrate or explain how raw meat should not touch cooked meat, and how we can stop bugs getting in our food with sealed containers and proper packaging). Light exposure (e.g. show where food stores best in dark, dry, cool places to prevent photodegradation). This Wikipedia page also delves into the many types of food preservation, for your reference. Use it to inspire science experiments in the daycare or preschool classroom! Sometimes, the foods we buy in the stores can be contaminated. This is because they were handled incorrectly at their processing facilities. For example, in 2017, bad raspberries from China found their way into ice cream. These bad raspberries made children at daycares sick! This wasn’t the fault of the person who brought the raspberries to the classroom. Sometimes, it couldn’t have been known until someone got sick. This is why there are food recalls. This is when a company asks the people who bought the foods to return them to the store. The store is trying to make things right with the people who bought the bad food. This is so that people don’t get sick. If they don’t do this, they can get in trouble. This happened with baby food pouches in Canada in 2017, for one example to show. While kids at this age won’t necessarily be able to absorb all this information, it would be wise for parents to be made aware of food recalls, especially if children could be affected at daycare. You’ll want to make it known in your classroom newsletter, for example. Here is a list of food recalls in Canada. Just like our article on preventing allergic reactions at daycare, kids should not share food for food safety reasons. Let’s say one child brings an infected or rotted food into the classroom and eats it. That one may get sick, but there is no need to have the others get sick as a result of sharing. While swapping lunch box options can be fun, be sure the kids know not to do so, and the reasons why. This can be as simple as setting up classroom rules that are written down and reviewed. What foods are safe for daycare lunch boxes? So now the question is, what foods are safe to bring to daycare in lunch boxes! If your child care centre has a food programme in place, the kitchen staff should have enough knowledge about food safe practices to prevent illness with children in daycare. You can inquire about their practices, or licenses, when choosing a daycare for your child. Kids should learn how to keep themselves, their food environment and their foods clean. This should become a habitual practice they adapt. For this section, please see our follow up article on this topic, with more detail, coming soon. Teaching daycare kids about food safety can prevent illnesses! While we acknowledge that kids will need to learn about food safety in increments, it’s not impossible to explain these matters at daycare. 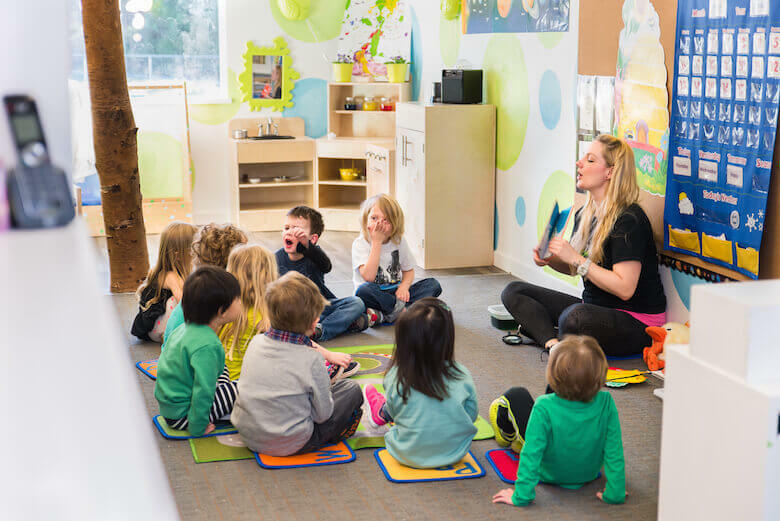 During your carpet time, especially at the beginning of a school year or semester, early childhood educators can teach the classroom about the practices that keep us free from terrible illnesses, especially related to our food. Be sure to check out our follow up on this article, which covers food cleanliness in daycares!